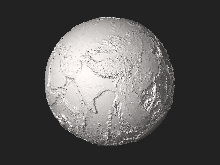 Present day Earth bathymetry (and altimetry). Data from the National Centers for Environmental Information's TerrainBase Digital Terrain Model. Bathymetry is the study of underwater depth of lake or ocean floors. In other words, bathymetry is the underwater equivalent to hypsometry or topography. The name comes from Greek βαθύς (bathus), "deep", and μέτρον (metron), "measure". Bathymetric (or hydrographic) charts are typically produced to support safety of surface or sub-surface navigation, and usually show seafloor relief or terrain as contour lines (called depth contours or isobaths) and selected depths (soundings), and typically also provide surface navigational information. Bathymetric maps (a more general term where navigational safety is not a concern) may also use a Digital Terrain Model and artificial illumination techniques to illustrate the depths being portrayed. The global bathymetry is sometimes combined with topography data to yield a Global Relief Model. Paleobathymetry is the study of past underwater depths. First printed map of oceanic bathymetry, produced with data from USS Dolphin (1853). Originally, bathymetry involved the measurement of ocean depth through depth sounding. Early techniques used pre-measured heavy rope or cable lowered over a ship's side. This technique measures the depth only a singular point at a time, and is therefore inefficient. It is also subject to movements of the ship and currents moving the line out of true and therefore is not accurate. The data used to make bathymetric maps today typically comes from an echosounder (sonar) mounted beneath or over the side of a boat, "pinging" a beam of sound downward at the seafloor or from remote sensing LIDAR or LADAR systems. The amount of time it takes for the sound or light to travel through the water, bounce off the seafloor, and return to the sounder informs the equipment of the distance to the seafloor. LIDAR/LADAR surveys are usually conducted by airborne systems. Starting in the early 1930s, single-beam sounders were used to make bathymetry maps. Today, multibeam echosounders (MBES) are typically used, which use hundreds of very narrow adjacent beams arranged in a fan-like swath of typically 90 to 170 degrees across. The tightly packed array of narrow individual beams provides very high angular resolution and accuracy. In general, a wide swath, which is depth dependent, allows a boat to map more seafloor in less time than a single-beam echosounder by making fewer passes. The beams update many times per second (typically 0.1–50 Hz depending on water depth), allowing faster boat speed while maintaining 100% coverage of the seafloor. Attitude sensors allow for the correction of the boat's roll and pitch on the ocean surface, and a gyrocompass provides accurate heading information to correct for vessel yaw. (Most modern MBES systems use an integrated motion-sensor and position system that measures yaw as well as the other dynamics and position.) A boat-mounted Global Positioning System (GPS) (or other Global Navigation Satellite System (GNSS)) positions the soundings with respect to the surface of the earth. Sound speed profiles (speed of sound in water as a function of depth) of the water column correct for refraction or "ray-bending" of the sound waves owing to non-uniform water column characteristics such as temperature, conductivity, and pressure. A computer system processes all the data, correcting for all of the above factors as well as for the angle of each individual beam. The resulting sounding measurements are then processed either manually, semi-automatically or automatically (in limited circumstances) to produce a map of the area. As of 2010[update] a number of different outputs are generated, including a sub-set of the original measurements that satisfy some conditions (e.g., most representative likely soundings, shallowest in a region, etc.) or integrated Digital Terrain Models (DTM) (e.g., a regular or irregular grid of points connected into a surface). Historically, selection of measurements was more common in hydrographic applications while DTM construction was used for engineering surveys, geology, flow modeling, etc. Since ca. 2003–2005, DTMs have become more accepted in hydrographic practice. Satellites are also used to measure bathymetry. 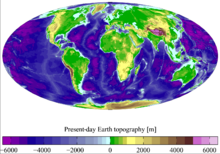 Satellite radar maps deep-sea topography by detecting the subtle variations in sea level caused by the gravitational pull of undersea mountains, ridges, and other masses. On average, sea level is higher over mountains and ridges than over abyssal plains and trenches. In the United States the United States Army Corps of Engineers performs or commissions most surveys of navigable inland waterways, while the National Oceanic and Atmospheric Administration (NOAA) performs the same role for ocean waterways. Coastal bathymetry data is available from NOAA's National Geophysical Data Center (NGDC), which is now merged into National Centers for Environmental Information. Bathymetric data is usually referenced to tidal vertical datums. For deep-water bathymetry, this is typically Mean Sea Level (MSL), but most data used for nautical charting is referenced to Mean Lower Low Water (MLLW) in American surveys, and Lowest Astronomical Tide (LAT) in other countries. Many other datums are used in practice, depending on the locality and tidal regime. Occupations or careers related to bathymetry include the study of oceans and rocks and minerals on the ocean floor, and the study of underwater earthquakes or volcanoes. The taking and analysis of bathymetric measurements is one of the core areas of modern hydrography, and a fundamental component in ensuring the safe transport of goods worldwide. ^ a b Audrey, Furlong (November 7, 2018). "NGA Explains: What is hydrography?". National Geospatial-Intelligence Agency via YouTube. 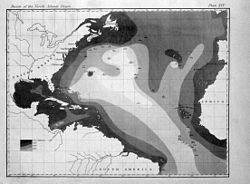 Wikimedia Commons has media related to Ocean topography. Scholia has a topic profile for Bathymetry. This page was last edited on 15 April 2019, at 18:36 (UTC).